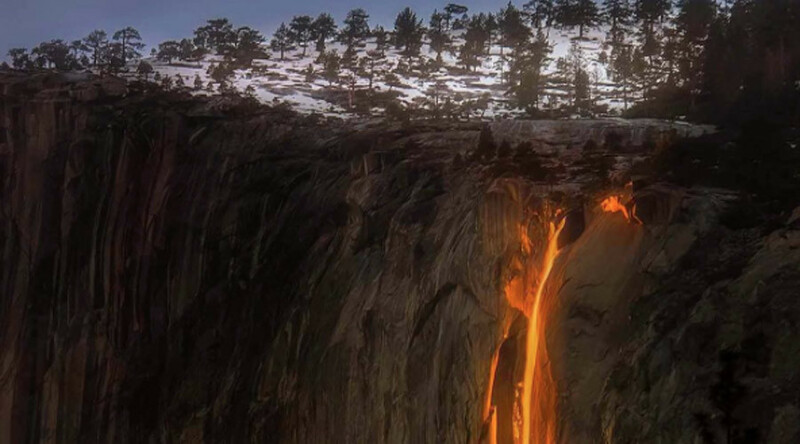 The firefall phenomenon is one of the many wonders found at California’s Sierra Nevada mountain park, occuring only at the end of February - and even then, only if conditions are right. While it may look like lava cascading down a molten cliffside, the glowing stream is actually more likely to freeze you than turn anything in its path into a smoldering mess. That’s because the firefall is the result of a setting sun reflecting off the park’s Horsetail waterfall and El Capitan rock face. Due to a lull in rainfall coupled with overcast conditions, the magnificent illusion had been absent in recent years, report CBS Local. Because life sometimes brings you things when you don't always expect it. 🌥 I was certainly not expecting this tonight!